Recent Posts Is Exchange Cart or Par Stock a Better Linen Distribution System? This is a great question, as it pits traditional linen distribution versus conventional linen distribution. 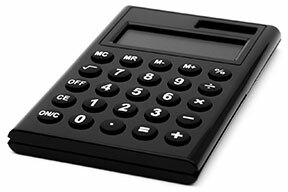 The answer isn’t so simple – it really depends a lot on how your facility is run. There are pros and cons to each linen distribution system, and you’re point of view depends on your situation, such as the current processes in place at your facility and the resources you have. In this article, we’re going to cover all that you’ll need to know in order to make an informed decision. To start with, we’ll begin by defining both systems. 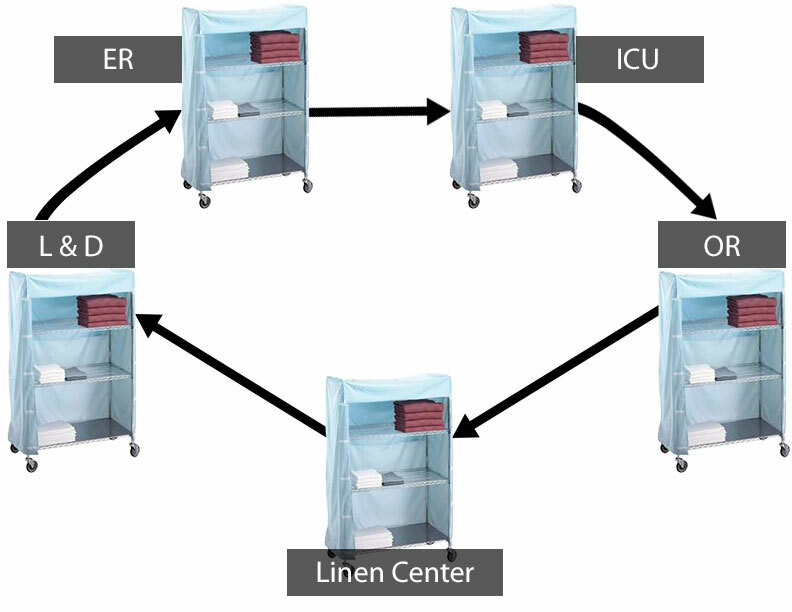 What is the exchange cart linen system? Simply put, this is where you have a pre-stocked linen cart that holds enough linen for a 24-hour period… (hopefully!). When the full linen cart has been depleted, a hospital staff member rolls a new cart to its location and returns with the empty one. Very simple. Note: Sometimes, the exchange cart system is called the “linen turn distribution system”. What is the par stock linen system? Stocked linen carts are sent to a specific location. 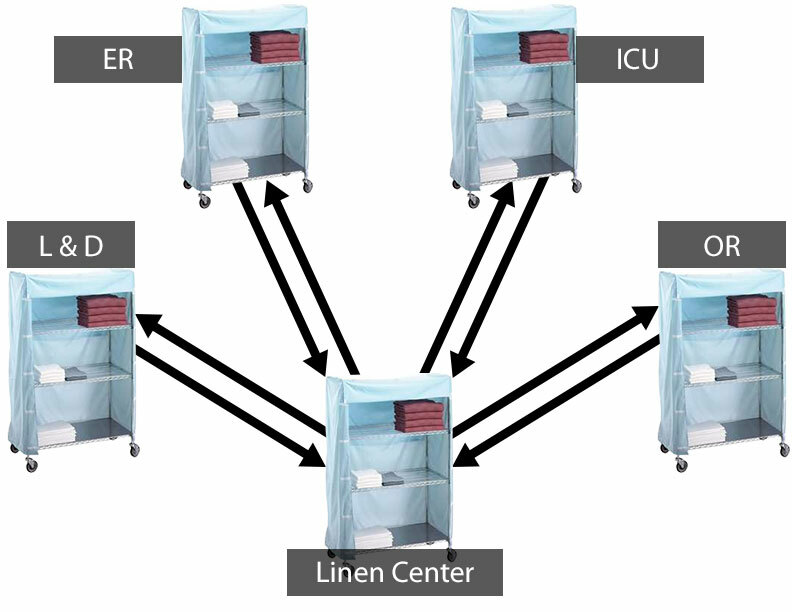 As the carts become depleted, hospital linen staff roll a full linen cart around to all the different locations, filling up the linen to pre-determined levels or quantities, or simply to whatever fits on the cart. A little more logistical, but also very simple. Note: A “par level” is normally considered to be a full day’s worth of linen plus 10% to 30% more, which is known as “safety stock”. Also, the par stock system is sometimes called the “replenishment linen distribution system”. Should I use exchange cart or par stock linen distribution system? The easiest way to start this question is to break down the advantages and disadvantages of both linen distribution systems. Another thing to consider if you’re on an exchange cart system is how much time your linen staff currently spends in transporting the carts. They’re taking one cart at a time – Point A to Point B. Back to Point A. Grab another cart and now go to Point C. Back to Point A. Grab another cart and now go to Point D. Back to Point A…you get the point. That can amount to a ton of time. In a moment, we’re going to talk about alEx linen distribution which has real-time inventory tracking. Your supply staff will know exactly the linen they have to replace at exactly which location. Without automation or real-time data analysis, your staff won’t know what needs to be replenished. With par stock being more efficient than exchange cart, it still has its issues. While par stock is widely regarded as more efficient and the better of the two systems, having the real-time data allows staff to pre-load exactly what they need at each location, which means having to make less trips. 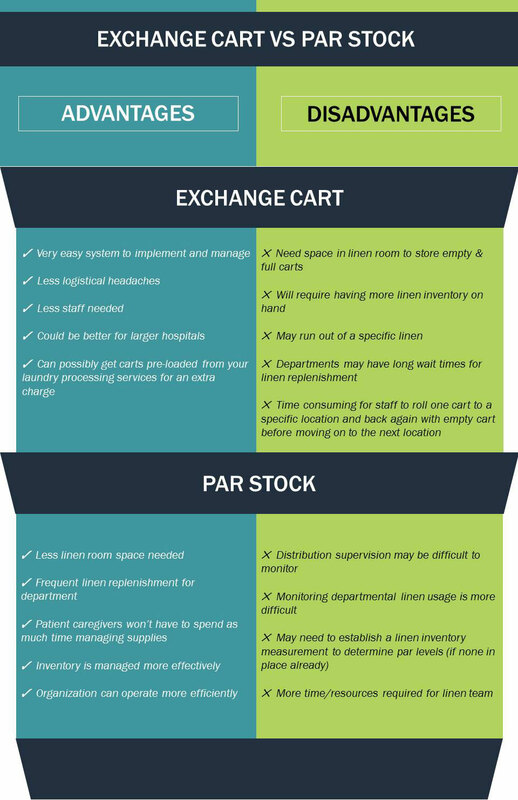 While both exchange cart and par stock have their differences, both systems insufficiently provide the best solution as stand-alone model. These two systems can work in conjunction or separately, but they need something else to take it to the next level of excellence. Linen distribution has been re-engineered. Meditek is the proud Western Canadian distributor of a ground breaking automated linen distribution system called alEx, the indisputable leader in linen dispensing machines and systems. Now, we tell you exactly how alEx takes your exchange cart or par stock system to the next level. First, we’ll address how alEx does against the disadvantages of both other systems. Then, we’ll tell you about the extra good stuff it does. Par Monitoring linen usage is more difficult clearView software to the rescue! Quite frankly, alEx encompasses all of the features, benefits and solutions that you’ve been looking for! (even if you weren’t specifically aware of the pain points you do have). Infection prevention: alEx completely encloses the linen, all the time. The beauty of alEx is that there are two systems available to accommodate both exchange cart or par stock processes. We work with whichever system you already have in place. However, the better alEx system is par stock. If you have an existing exchange cart system, implementing the preferred par stock alEx system really is quite straightforward and easy.